This is a short story written by my ten year old daughter, Sydney, as part of our weekly creative writing class. Equestria is a magical land inhabited by ponies, pegasi, unicorns, and more. One of the most unique inhabitants of Equestria is a creature known as Discord the Lord of Chaos. He is super mischievous and loves to play tricks on all ponies, but especially on the princesses of Equestria and a group of friends known as The Mane Six. Although, he does have quite a soft spot for one of the friends, a sweet and friendly pegasus known as Fluttershy. But definitely not for Fluttershy’s bunny, Angel. He hates that guy. Discord is a mixture of different mythical creatures. He’s also a little nice, mean, very loud, and thinks he’s silly. Fluttershy and Rainbow Dash have been friends since they were fillies. They met because Rainbow isn’t afraid to stand up against a bully for somepony that she doesn’t even know. Rainbow Dash is light blue with a rainbow colored mane. She is nice, loud, serious, silly, and a little full of herself. She is always in for an adventure and represents the element of loyalty. Fluttershy is yellow with a pink mane. Though Fluttershy is a pegasus just like Rainbow Dash, she lives in a cottage on the ground. She lives with all of her little animal friends and takes care of them. She is friendly to all creatures, even Discord. In fact, Discord lives with Fluttershy because she was given the task of reforming him from his evil ways. This is why she has put full trust in him and gained his friendship. As you might have guessed, Fluttershy represents the element of kindness. One of Discord’s least favorite things in the whole world is to be bored. One particularly boring day, he got into trouble with Angel. Discord kept using his magic to tease Angel, and Angel kept on being feisty and struggling away. Fluttershy caught them and took them to Twilight so that she could get help. “I’ll do it the easy way!” Fluttershy shrieked quietly. So Twilight looked up a spell in her spell book and punished Discord’s magic. The next day Discord snuck into town while Angel and Fluttershy were napping. He thought to himself, “I’m only going to town to get something to eat. It won’t hurt to do it one time, would it?” When Discord got into town he immediately saw Twilight. He knew that if he lied to Twilight she would know it. He stood there wishing that he had his magic so that he could morph into the pony that was standing in line in front of him at the food court. Suddenly, Discord saw a stuffed animal that looked exactly like Angel. He rushed over to the store, grabbed the doll, left three dollars on the counter, and then rushed back into line faster than you could say LIKITY SPLIT. Twilight was just passing by when she noticed him, “Discord what are you doing here? It’s only been one day and I thought you would still be with Angel locked up in that room.” Then she noticed that something small, white, and fluffy appeared to be hugging Discord’s leg. “You know you can’t trick an egghead like me. I know you just bought that doll. Plus, you ripped it,” said Twilight flatly. While Discord was walking up to Fluttershy’s house in disappointment, he saw a Timberwolf glance and glare at him from within the Everfree Forest as it passed by. Discord knew that timberwolves were very dangerous. Timberwolves were made out of enchanted sticks. Thier whole body was built out ot of them! Timberwolf sticks were extremely sharp and probably made the timberwolves angry a lot. Whenever a pony sends a stick flying towards them, and causes the timberwolf to break into pieces, it’s body parts reunite with each other and start attacking again! And sometimes when there is a whole pack, all of them will unite as one giganormous timberwolf! Discord went to the other side of the path because he didn’t want to mess with one when he didn’t have any magic. Then suddenly he had an idea. He went screaming into town that a deadly timberwolf was attacking Fluttershy! Rainbow Dash heard him and dashed over immediately, but when she got there Discord burst out laughing, “I thought that Twilight was coming, not you, but this is even better! (laugh laugh laugh) After all, she’s the one that traveled all the way to the ends of Equestria! (laugh) Say, why did you come instead of Twilight? TELL ME!” laughed Discord. Rainbow Dash began, “Well first of all, I don’t know why you wouldn’t expect me to be here. I am the pony who represents the element of loyalty! Twilight doesn’t. She represents the most powerful element of harmony, the element of magic!” All of a sudden Fluttershy opened the door to find Discord and Rainbow Dash arguing. “I see,” said Fluttershy, then she pulled Discord inside and told Rainbow Dash to leave (politely). She closed the door and that was that. Rainbow Dash flew away realizing that she was late for sky duties. Fluttershy knew that he was saying sorry and then she looked happier than Pinkie Pie! This was quite unusual. “Oh yay! My sweet little bunny has found it in his heart to apologize! I’m so proud Angel. I saw how you realized your mistake and said sorry. I’m going to let you have whatever you want for lunch and dinner!” Fluttershy cooed and Discord was outraged, but still accepted Angel’s apology. He figured it wouldn’t hurt to be polite and perhaps Angel would share his dinner with him. Luckily, Fluttershy let Angel share a leaf with Discord at lunch. Discord gulped it hungrily and asked for more, but Angel refused. He was starving too! His plate was literally stacked to the ceiling! Surprisingly, he ate it all. Flutter shy was astonished and told him no snacks for the next few days and that he should forget about dinner. Disappointed, Discord walked back into Angel’s room. When he walked in, he began to choke. “The air is really dirty in here,” Discord thought. Flutter shy heard him choking and checked on him to make sure that he was alright and that he wasn’t eating anything. When Fluttershy entered the room she choked too and told Discord to go outside to get some fresh air while she fanned out the air. “She is so kind to me,” thought Discord. As he walked outside he noticed a kitten that had a black eye and was limping. He wanted to rush over and pick up the cat to take it to Fluttershy. Discord knew he wouldn’t get in trouble because helping the kitten was the right thing to do. But unfortunately the kitten was walking away from him and into town. Twilight was secretly trying to spy on him. Discord saw that the cat was walking toward Rainbow Dash but she didn’t even see it. Discord didn’t have much time, if he was going to get the kitten, so he got out of his chair and face planted into an invisible forcefield that twilight had made with her magic. “Not so fast, Discord, you aren’t going to get away this time!” Twilight said. Discord replied with a worried tone, “I was just going to go get that poor beat up kitten over there.” He pointed to the kitten. Twilight saw it and realized that Discord was trying to do something good. She lowered down the forcefield so that Discord could get it. Discord made it into town and grabbed the kitten. He stood up and found Rainbow Dash hovering above the ground staring at him. He remembered yesterday and decided that this was a good time to make more mischief, so he cried out that Fluttershy was being attacked. Rainbow Dash looked at him with disbelief, but went to help anyway. After all she did represent the element of loyalty. She knew the old saying, “fool me once shame on you, fool me twice shame on me,” and yet she still went to see if he was telling the truth. The next day Fluttershy went outside to do her daily animal duties. First, she made sure that all of the animals were hydrated. Then, she went to check on the kitten that Discord had rescued. She surveyed the kitten’s leg and found it to be broken. She decided to name the kitten Kittery because she thought that it sounded like surgery, only for kittens. Then, suddenly, a timber wolf jumped out of the woods and rushed towards her with a worried look. Discord thought that Fluttershy was being attacked. He quickly tried to use his magic, but then remembered what Twilight had done. He realized that he couldn’t help and started to panic. He ran outside, flicked Twilight’s horn to make the forcefield go down, and ran across town. And then remembered what Rainbow Dash had said to him so he stopped in town square and yelled as loud as he could, “FLUTTERSHY’S BEING ATTACKED BY TIMBERWOLVES!! !” every pony looked at him in disbelief and continued shopping, Rainbow Dash flew over to him and said, “Word gets around you know. See you later Discord!” And she dashed away faster than you could say, “But?” Discord frowned and looked at every pony. Then out of nowhere a howl came from Fluttershy’s cottage. Rainbow Dash rushed over as fast as she could. But when she got into Fluttershy’s backyard they found a very odd scene. A timber wolf was laying down on a cot while Fluttershy was doctoring it’s body. Flutter shy told the timber wolf it was OK and that she was all better and that she should stay with her. Then Fluttershy noticed that Discord and rainbow Dash were staring at her as if she were crazy! “Discord why did you tell every pony that I was being attacked? Because I actually wasn’t,” said Fluttershy. Discord replied “Well, when I looked out Angel’s bedroom window I saw a timber wolf running towards you, so I panicked.” Flutter shy looked at both of them and said, “Well I can see why you would think that I was in danger. But I wasn’t. You see I found this baby timber wolf when I was younger and I raised her to be strong, her name is Amanda. And she’s pregnant now! Aren’t you excited? Amanda came running for me so that when she has her babies they won’t be harmed.” Discord and Rainbow Dash understood and walked away, lesson learned. Eventually, Discord apologized and actually meant it. And Rainbow Dash promised that she would always be there, even if Discord kept lying. Discord decided to write to Princess Celestia. I have learned that if I tell lies too much, others won’t believe me. This is bad because some pony could get very hurt. I’ve learned that my lies are hurtful. Rainbow Dash didn’t believe me when I said that flutter shy was being attacked. Luckily, Fluttershy wasn’t being attacked. Instead she was doctoring a timber wolf. I’m glad she can understand animals because, sometimes, she’s just crazy! I have learned to tell the truth because my lies bring consequences. Tell the truth for your lies can bring consequences. Always stay true to your element. We play cards as a family on a near-daily basis, usually over dinner. Our game of choice is Uno. This game is easy enough for a 4 year old to grasp, but still fun for the rest of us. In order to combat sticky fingers we use the Uno H2O version of the game which comes with plastic cards, not paper. In fact, every month or so I fill the sink with water, bust out the soap, and soak the remnants of meals long forgotten off of our cards. 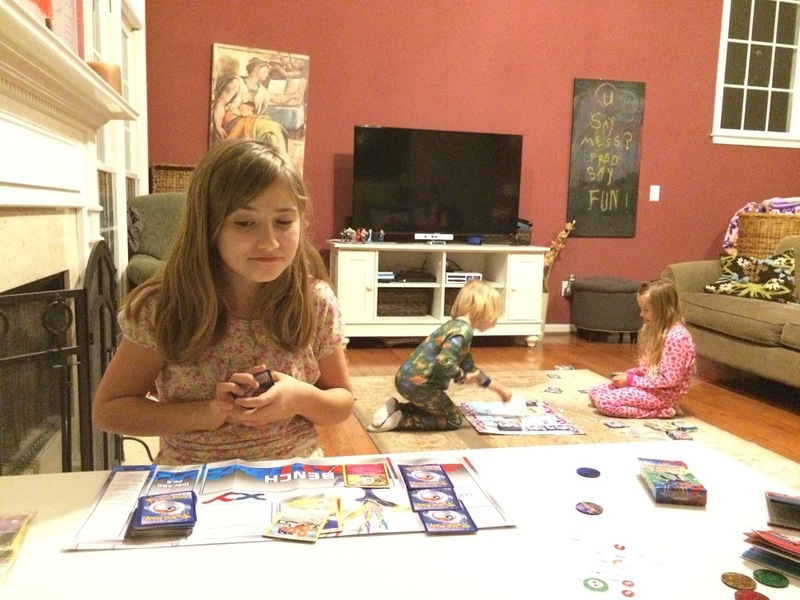 Playing cards is a great way for families to bond. It turns out that in our case, it is also a great way teach important lessons on good sportsmanship. When we first started, it was really difficult for Elliot to lose. He would throw a tantrum and sling his cards all over the floor. Often, he would do this in the middle of the game after receiving the grumpy side of a +4 wildcard from one of his sisters. Whenever this would happen, we would just continue playing without him. Do you want to know what a 4 year old hates worse the receiving a draw 4? The rest of his family continuing to play the game without him. Poor Elliot would throw himself out of the emotional frying pan and into the proverbial fire. Ugh. Week after week the four of us, his two older sisters, his mother, and I, modeled two things. The first was how to have fun in spite of one person's bad attitude. The second, was how to have fun while losing. As the rest of us played on, we challenged each other, we growled at each other, and we boasted openly. When we lost, we threw our arms up in the air in melodramatic exasperation! We threw mock tantrums, littered with smiles and silly faces. When we won, we victory danced. When we lost, we huffed and we puffed. But always, at the end, we accepted defeat and celebrated the winner. "Good game, Savannah! I don't like losing, but I am happy for your win. You earned it!" "Noooo! Mommy is going to win!? We gotta stop her! I have a skip card, someone change it to blue!" "YES! I CAN! NOT! BE! STOPPED!" It took months and months, and tantrum after tantrum, but eventually, slowly, at long last, it worked! Elliot is a completely different player today. He still has his moments, especially when he comes so close to victory that he can taste it, and then someone else unexpectedly swoops in and beats him, but the truth is that he is more likely to throw a mock tantrum than a real one. The two older girls received Pokémon cards for Christmas, and I've been playing with them when we go on our coffee dates. Not wanting Elliot to feel left out, I recently grabbed a deck of cards for both me and him. The rules are much too complicated for a 5 year old, so I created special Pokémon: Family Rules that keep the game simple and face-paced. Elliot has already lost to both me and his sisters, and the only time I’ve seen him throw a fit or cry was when he lost his cards and couldn't play with me. There are a lot of things I'm doing wrong as a parent. If I was a braver man, I'd write more about those things. For today, however, I'm going to stay content with celebrating this victory because it's not mine alone. It's a win for the whole family. We all earned it, especially Elliot. Pokémon rules are much too complicated for an impatient boy of 5 years, so I invented an easier way to play. My rules allow for a more fast-paced action and an overall simpler, less complex game. Start with 7 cards each. Use the standard game board/layout and turn flow: Draw, Use Cards, Attack. Players can attach one energy per turn. All Pokémon do 10 damage per attached energy card. All Pokémon have 50 health. All attacks require a coin flip for success. The excitement for Elliot is found in the coin flip. He loves using the coin that came with his Ice Shock theme deck. The second best part is using the Pokémon that looks the coolest to him, without worrying about stats, numbers, or special abilities. In this game, all Pokémon are equal. From there you can choose whether you want to use Trainers and Item cards. You can tweak the decks and only use the cards that fit your little person. We have some healing cards and some of the cards that let you dig through your deck and find extra energy or Pokémon. We don’t use evolution rules, a Pokémon can be put into play as the active attacker regardless of stage.